Discover an essential set of scholarly journals and general interest titles supporting research across disciplines covering everything from art and literature to economics and the sciences. 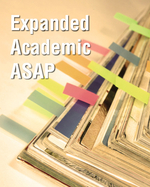 Expanded Academic ASAP has full-text access to most publications to the present day. However, each publisher determines when the latest content becomes available for use through this service. Full support for these features is available from the More - Help menu inside Expanded Academic ASAP.